LOS ANGELES, Calif. /California Newswire/ — Neotrope, a marketing, PR, and information publishing company founded in 1983, today announced its annual Nonprofit PR Grant Program for 2013. Ten U.S. based charitable non-profits will receive in-kind grants totaling $50,000, including public relations, news dissemination and online marketing services, as part of the company's 30th anniversary. The Non-Profit PR Grants program was originally launched in 2000 to help assist U.S. 501(c)3 worthy causes to raise awareness, attract halo sponsors, and better connect with donors and volunteers. For 2013, the Grant has been named after the company co-founder, the late Dr. J.L. Simmons, PhD, who passed away in 2003. 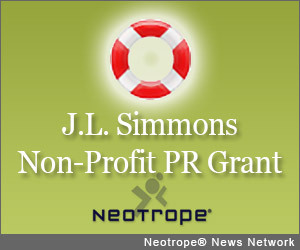 Henceforth the Neotrope PR Grants will be known as the "J.L. Simmons Non-Profit PR Grant." A dedicated portal for information and this year's grant application form has been established at: http://prgrants.com/ – deadline to apply is Feb. 15, 2013. "When we launched the grants program in 2000 our intention was to leverage our background in marketing and PR; we felt it more useful to help an organization 'spread the word' over giving them a small cash donation," said Christopher Simmons, member PRSA and ASCAP, and Neotrope CEO. He added, "My father and I both wanted to help worthy causes who often don't have the staff or funding to promote their organization as effectively as they might. This program directly addresses that need. Starting this year the grant program has been renamed after him, which I think is appropriate for all the inspiration he provided to both me and so many of our clients." Each 2013 PR Grant recipient chosen from qualified applicants will receive free news distribution through Send2Press(R) Newswire, as well as free run-of-site advertising across the Neotrope News Network for 12 months (through March 2014); the combined value of in-kind services is approximately $4,500+ per recipient. Neotrope has been honored to help many worthy causes, including Camp Blue Skies, Children Awaiting Parents, Fresh Start Surgical Gifts, Girls Write Now, Move for Hunger, Pacific Pinball Museum, The Bob Moog Foundation, Starlight Children's Foundation, and dozens more. Neotrope(R), established January 1983 in California, USA, is a family-owned small business specializing in brand identity, advertising, marketing, SEO, content development and public relations (PR). The creative team includes accredited PR pros (including PRSA members), working journalists, published authors, musicians, and other contributing talents. Neotrope was an Inc. 5000 company in 2009, and has an A+ rating with the BBB. * 2012 Non-Profit PR Grant Recipients announcement: https://www.send2press.com/newswire/2012-02-0229-001.shtml .